When shooting in bright light, a neutral density filter can be extremely useful if you want to use a large aperture for some nice background blur. A new Canon EF to Sony E-mount adapter by Fotodiox incorporates a variable ND filter so you don't have to buy one for each lens. The $100 Vizilex ND Throttle is perfect for people who own either a Sony NEX or Alpha series mirrorless camera and want to attach their Canon lenses. The unique part about this adapter is the built-in variable ND filter. A filter like this cuts the light reaching the lens, which allows you to use larger aperture settings without having to bump the shutter speed super high. This is especially useful for video, when you are limited to one shutter speed but want to shoot at, say f/1.8 for that cinematic shallow focus look. It's also great for shooting long exposures during the day, when the light would usually overexpose with a slow shutter speed. Variable ND filters usually screw on to the front of your lens, which means you need a separate filter for each lens you own, since they all have different size mounts. That's a lot of filters to buy. 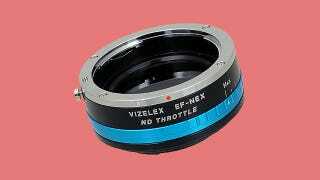 The Vizilex ND Throttle is a one size fits all kind of deal, since it sits behind the lens instead of in front. The big downside to this adapter is that autofocus and image stabilization of Canon lenses won't work at all. Fotodiox may work on a "smart" version that maintains that functionality, but for now you'll have to live without it.